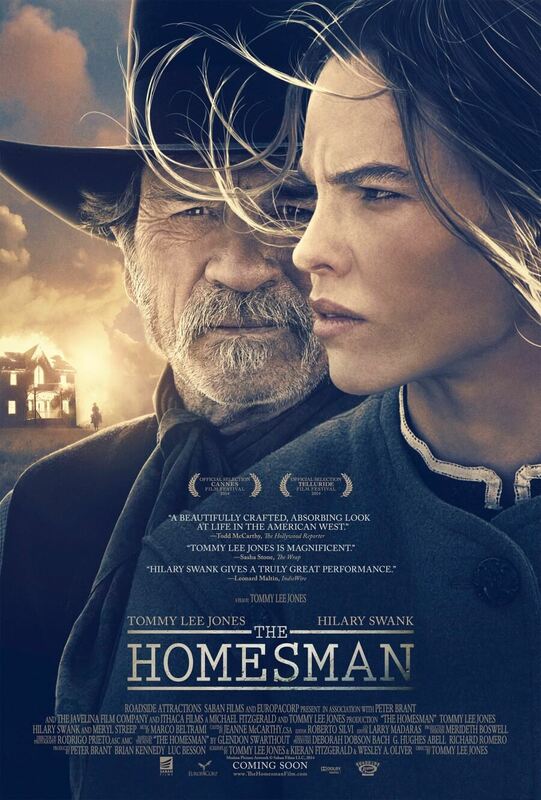 Say whatever you want about Tommy Lee Jones and his notoriously prickly personality, but the guy knows how to make a pretty decent flick, as is the case with his sophomore directional feature The Homesman. As a director, Jones is able to captivate the audience with a well-paced and at times daring story, combined with cinematographer Rodrigo Prieto’s gorgeous and atmospheric shots and composer Marco Beltrami’s haunting and effective score. The film is based on Glendon Swarthout’s novel of the same name, and it is adapted to a fair degree while also being its own thing up to a point, certainly taking on the most important rule of a visual medium: “show, don’t tell”. In all, it’s a well-made effort from Jones behind the camera. But in front of it? That’s where things get a little more interesting to talk about. Though it may seem as though Hilary Swank (remarkable in an emotionally-layered role) is front and center here, it is actually Jones that takes up the screen in a far showier role. His character is even given more development than the three insane women he is tasked with transporting across the country, and by definition they should have the most dramatic weight out of anyone – though they do have traumatic backstories established; one (Grace Gummer) is a mother to three stillborns; another (Sonja Richter) is mercilessly raped by her husband after her mother passes away; and the third (Miranda Otto)… man, oh man. We get to see what she does that drives her mad, and it’s a disturbing image if there ever was one. But the point is, Jones seems to give himself and his character far more credit than the ones who really deserve the attention – the final scene is testament to that, in which something happens concerning the fate of a major character but the focus is just on Jones showboating to the audience like an attention-hungry cad. Obviously, there’s a deeper meaning to this moment that ends the movie on a bittersweet but rather mean note, but it just comes across as callous and self-indulgent. Making himself the overall hero of the flick and not Swank’s lonely pioneer woman also manages to undo the film’s self-imposed label of the “feminist Western” (or “femin-estern”, if you will). When it actually focuses on Swank or any of the other major female characters – including a late extended cameo by Meryl Streep as a reverend’s wife – the label is justified; these are strong-willed and well-written characters with goals of their own and doing whatever it takes to accomplish it. We would also say that their ambitions stretch further than simply finding a man, but when we learn that one of Swank’s desires is to find a suitable partner to conquer her loneliness (and her subsequent depression) that simply wouldn’t be entirely true. The world needs better female characters in film, whether it be mainstream or independent, and though it’s not an entirely smooth step in the right direction with this film it’s still a step regardless. So, it’s disappointing when Jones feels the need to (literally) insert himself into the proceedings and rule over the second half of the film with a tight, masculine grip. It’s as though Jones has these fascinating female characters on his lap, but has absolutely no idea what to do with them so just says “sod this, I’m running things here and what I say or do goes”. 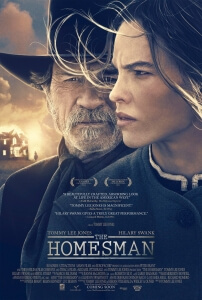 The Homesman is a strong directorial effort by Tommy Lee Jones, with high points going to its acting, cinematography and musical score, but the decision to cast himself as the main hero in a supposedly-feminist film undermines its intentions and comes across as an unfortunate exercise in vanity over storytelling.